Last year we really wanted to tap our maple trees to make our own syrup, but I procrastinated so we missed our window of opportunity. We decided about a month ago to get serious about it this year so we started watching the weather and planned our time to collect the sap. Last weekend conditions were favorable, so we made a trip to Lowe's for some supplies and set up our taps. Since this is our very first attempt at collecting sap, we looked online for an easy way to tap maple trees and found this video to be helpful in planning out the process. We are total newbies and have already made several mistakes, but I thought sharing our experiences might help others who are wanting to tap their maple trees for the first time as well. If you are experienced and have suggestions on how we could improve our process, please let us know. We'd be happy to hear any advice you'd like to share! 1) Find your maple trees. This is kind of a given obviously, but if you don't know how to identify trees without their leaves, you could be searching your woods forever. We called our local resource forester with the MDC who we worked with for our logging this past summer. Marty has been such an invaluable (and free) resource. I called him last week and he came right out and marked all of our maple trees for us so we'd know which ones to tap (it is advised to tap a tree only when it is healthy and the diameter of the tree is at least 12"). 2) Watch your weather patterns to know when it is the optimal time to tap. The tree sap starts to flow the best when nighttime temperatures are below freezing and daytime temperatures are above freezing. The sap will usually flow for about 3-4 weeks, but the best sap is produced early in the season. You can buy tapping kits online which I'm sure work really well, but we didn't want to wait for anything to come in the mail and tried to keep things as cheap as possible by making a quick trip to Lowe's. 4) Let the tapping begin. Using your 5/16" bit, drill a hole at a slight upward angle 1.5" deep at chest height on the tree (this is the hole the sap will flow out of). In the same spot, using your 1/2" bit, drill a hole 1/2" deep (this is the hole that you insert the tap into). David put blue tape on each tap as a guide to know when he hit the correct depth. Insert the tap by "tapping" it in with a hammer. (This is where we made our first mistake. We wanted to go as cheap as possible, so we bought plastic taps and 3 of the 5 broke while trying to insert into the tree, so we went back and purchased the metal variety which worked like a charm.) You may see the sap begin dripping out immediately at this point, depending on the time of day. Attach tubing to the spigot on the tap and feed it into the bucket at the base of the tree (we drilled a hole in the lid the exact size of the tube). Secure the lid on the bucket to keep out any debris. Our lid did not fasten tight on the bucket, so we had to put a rock on top to keep it in place. And that's it! Now the waiting game begins. We had a pretty cold day yesterday and temperatures stayed in the 20s, so the sap froze and did not flow. The next few days should get above freezing, so hopefully we will be able to collect more sap. We have read that the ratio of sap to syrup is 40:1, so if we are able to fill one 5-gallon bucket with sap, we should get about 16 oz of syrup once all is said and done. For our first year, I'd be happy with that. If it works out well, next year we will expand the operation, but this year we are focusing on just learning the process and working out all the kinks. Stay tuned for part 2 to hear about our method for turning the sap into syrup! Have you ever made your own maple syrup? Did you find it harder or easier than you thought it would be? How fun! We never have but it looks like it would be a really fun experience and tasty as well...can't wait to hear how it all turns out! I have never had homemade maple syrup by MY GOODNESS this sounds like it would be amazing. You should have all your blog followers over one day for a sampling haha! I never realized just how much work it was to make it from scratch, but maybe one day I'll give it a go! I have always heard of tapping for syrup but have never seen it in actuality until today.. This is great! I love the fact that you will have your own pure maple syrup...awesome... It is soooo expensive to buy. Excited to read part 2.. Blessings and happy tapping! Awesome!! I would love to have enough trees to tap to make our own syrup. We us it instead of sugar for baking, but it is expensive. It would be nice to make our own. We usually take trips to Vermont to buy large bottles of syrup to bake with because it tastes so much better!! Can't wait to hear how your syrup turns out. Tammy, when we lived in Western New York, fresh homemade Maple syrup was one of the local treats we most loved eating! It was pretty popular to make it there, and while we never did try to do it ourselves, we enjoyed it from friends who made it. It's hard to beat real Maple syrup on a warm buttery pancake:) Here's wishing you lots of success with your syrup!! Oh my gosh ... I bet that first syrup will be the most delicious you ever had. Can't do tapping here, but I've had other projects that made me feel so homesteady and old-fashioned in the good way. That sounds great, and I can't wait to hear how it turns out! Oh wow this is going to be so tasty. How nice you can make your own. Enjoy!! I have no trees to tap, but I do love maple syrup and buy it when I find a good organic source. I will stay tuned til next time. Thank you for sharing your experience with the rest of us. I am really looking forward to reading about your maple syrup making process. A 40/1 ratio sounds grueling to me, but I am old. Good luck on your first batch! My family has been making maple syrup for close to 200 years (I only know this because my Uncle is a history buff and has done significant research on this subject with regards to our ancestors). We don't get to tap until generally late March or early April in Northern Wisconsin, so it will be fun to see how your batch goes! How are you planning on cooking it down? Do you have a special pan or are you just going to try to do it in batches on your stove? Looking forward to the next installments on your blog! I love Maple syrup but never knew how it was made - that was a really interesting blog post - thanks so much, I knew wandering around on here for hours would be more educational than getting on with my ironing. There is nothing quite like real maple syrup - I can't even look at the fake stuff anymore! Wow - you guys get to tap early - I think maple season in Vermont isn't until March or so. Girl you never Cease to amaze me!!!!! OMGOSH you are collecting your own sap.. Can I be you for JUST a day .. That is amazing.. The place is amazing. JUST awesome life you have created for yourself. I am so happy for you ..and blessed to KNOW you my sweet friend..... Have a wonderful day and when I come up your way ..WE are making me some pancakes ..so I can have some of that SAP sister...... HUGS as always love it here !!!!!!!!!!!!!!!! Seriously Tammy - is there anything you guys don't do? I've actually been considering doing this - at some point! I love learning something new everytime I visit your blog!!! Woot Woot! Sounds very interesting, we don't have any maples only grape vines and few cypress trees so i'm a bit jealous, perhaps we can barter some syrup for wine, lol. Good luck Tammy and please keep up posted on how it goes. Super excited for you guys! Hi Tammy.. Yes, we have done this in the past.. It sure takes a lot of boiling down.. smile.. It is way too cold here in Eastern Canada for another couple of months before we can even start..
Once you get the concept you are going to have a wonderful product to sell. Living in Maine I have never done this but every year we go to visit a sugar shack on Maine Maple Sunday and to watch the whole process. It is amazing to watch and to see the finished product and the taste .... well it's divine. I have however, while working at Apple Acres Farm in Hiram, Maine....learned how to do the same process extracting juice from the apples and processing it, boiling it down into a thick, rich syrup that is absolutely delicious. Same process different trees. It's a lot of hard work but so worth the effort for the wonderful product that you ultimately end up with. Good luck with this new venture....I hope you are able to market it and sell for a profit......and if not that...then to have enough for your family to enjoy. P.S. In fact I just remembered I have some photos from last year when I went to Bacon Farm for Maine Maple Sunday so I will post them on my blog.....it's such a neat place. Pretty cool! We haven't done anything like this before. Please keep us posted on your progress! Awesome! No wonder maple syrup is so expensive! Enjoy!! How cool is this??! I wish we had maples down here close to us where we could do this! wow! we just got our taps today. THANKS for this post! cant wait to see the rest of the steps. We tapped our trees last year for the first time. I want to do it again this year, but we shall see. We tapped out trees two years ago and got 1 gallon of finished syrup. Not bad for 3 trees. Last year the weather did not cooperate. But this year we are getting a "nice" freeze. Maybe a little too cold LOL We are freezing our bums off. 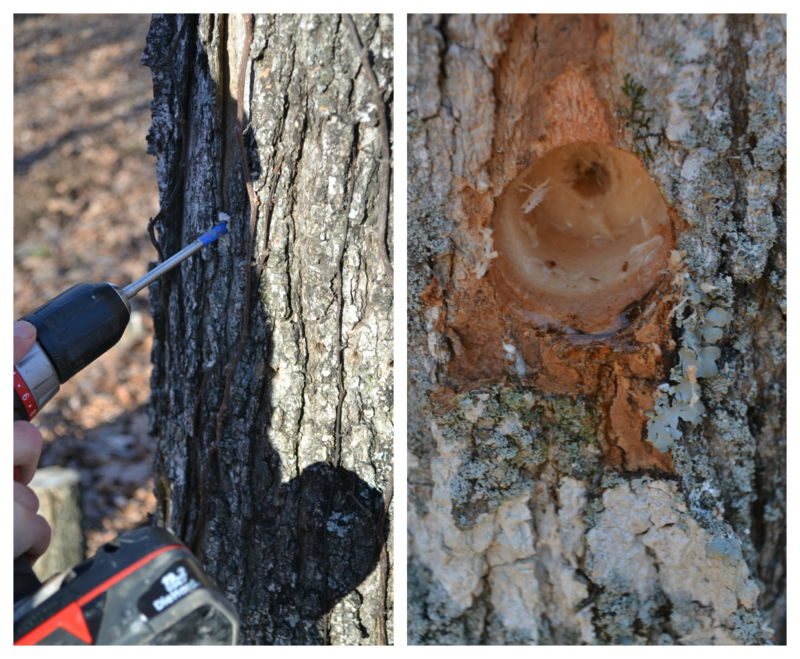 We went low tech using rubber pipe pieces and milk jugs to collect our sap. And do boil it outside LOL our your walls in your kitchen will be a mess from the moisture. We are no experts but let me tell you, once you have your first taste of your very own syrup, you'll be sucked in for life! My hubby is building a sugaring off table in the backyard and we are so ready to get flowing! (http://bornagainfarmgirl.blogspot.com/)Can't wait to hear how your experience goes! Love this! Can't wait to hear how it turns out!! Looking forward to Part 2! I have always been curious about what is involved in this. Maple syrup season is one of our favorite times on the farm!! You will get way more than 5 gallons!! Make sure you have a large container to store all of your sap in till you're ready to boil! I posted about sap to syrup last year with pics if you want to check it out. Fun, fun, fun! So excited for you guys! Good on ya! Maple syrup is one of the best natural sweeteners and so much easier on your body than processed sugar. I'm looking forward to seeing you turn the sap into liquid gold! Thanks for sharing. Amazing - I'd love to try this. We're want to do this too, have the equipment but don't have the guts to do it yet! Can't wait to see how it turns out for you! Oh we would so love doing this. There is just nothing like the taste of pure maple syrup. You are amazing!! We have a maple tree growing on our patio - that is - our patio is wrapped around half the tree. Can you tap ANY maple? Or does it have to be up north type of maple?? oh how neat!!! i hope your syrup making is a huge success!! This is on my bucket list to one day see and taste. Tammy, I always wondered how this was done! I love to learn something new, I enjoyed your post today. I have no maple trees, but you never know when this info might come handy! I'm crossing my fingers for you to get lots of sap! Thanks so much for sharing this on Wildcrafting Wednesday and The HomeAcre Hop!!! Good luck! Hoping we get a good year. Still too cold here which is just fine with us, we are so not ready to devote all our time to boiling sap - it's a long process that needs your full undivided attention! :) We need to get organized though. Hope you get some good syrup!